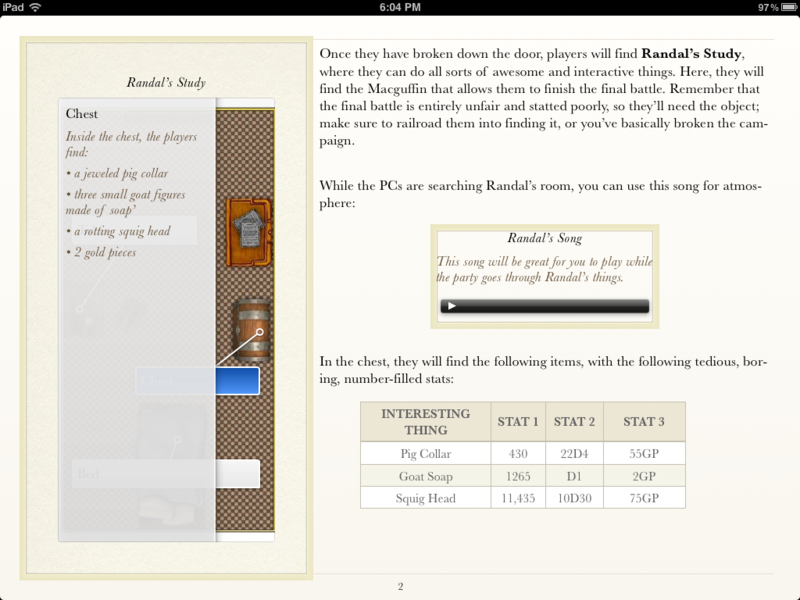 Warhammer Quest for my iPad? Yes, please. Yay! Rodeo games announced recently that they are developing an iOS version of the classic board game Warhammer Quest. I played the original version during a session in which a local board game collector pulled out a whole bunch of his “classics”; it’s a quirky and fun little game, partly because it’s so hilariously perilous. I’m looking forward to seeing it again in an electronic version, and as always, I’m delighted to see more Warhammer products for iPad. Here’s IGN’s scoop with a bit more info. A detailed description of the original board game can be found here on Board Game Geek. I know many of you have been out at GenCon, playing your fill of games and seeing more stuff to buy than you could possibly purchase in a lifetime. I just thought I’d mention a neat Kickstarter project that has some really great potential: Brass Monkey’s Dragons Gameboard. This nifty little package would let you display a battle map on a TV or large computer monitor for your players to see during tabletop gaming. Each of them could, in turn, manipulate their own tokens on the map via smartphones or tablets. I absolutely, positively LOVE this idea. Using individual handheld devices at the table would keep my players engaged (and would keep their phones on something game-centered instead of on Twitter or Facebook.) A system like this cuts down on prep time, too; I wouldn’t have to set up a table full of cardstock buildings and minis, spend the morning keeping the kitten off the table, and then switch out a million tiles and buildings mid-session when the PCs moved to a new area. On the other hand, I personally dislike the art style here–I’d like to see something that looks more like an actual hand-drawn map, something less griddy/pixelly. The games I tend to favor don’t focus on strategic battles, so I use maps flavor more than for tactical clarity, and a bunch of colored blocks don’t really add much flavor to a game. The project promises to remain open source, though, so DMs would have the opportunity to implement their own tilesets and could undoubtedly figure out how to make use of the system for other sorts of RPGs. This project is definitely one to keep your eye on; Brass Monkey has a solid idea, and for those with limited table space, it might mean the difference between making your home a viable place to play and always having to tote your minis and chips to someone else’s house. Unsurprisingly, I went ahead and coughed up the $42 for the Codex: Space Marines just to see how Games Workshop managed the iBooks format. My willingness to do so is entirely inexplicable, by the way; I don’t play 40K, and I don’t have a Space Marines army. I did enjoy the fluff in the book, though, and if I ever get around to running Rogue Trader, I suppose it will come in handy. Also, it’s almost my birthday, so why not? It’s not my intention to critique the book’s content; instead, I’d like to say a few words about Games Workshop’s use of the format itself. If you go to iTunes and look up this book, you’ll see more than a hundred reviews that give the book one star. Many of these thoughtful, honest, ethical reviewers haven’t even bought the book–they’re just complaining about the price point. Apparently they feel as though an electronic version of a book shouldn’t cost the same as a print copy, and that’s enough for them to give the book one star. What we’ve learned here is that iTunes shouldn’t allow you to review a book you haven’t bought from them. After having spent some time with the text, I think GW’s implementation of the Codex is a wee bit flawed, but very promising as a whole; it’s not yet five stars, but it’s certainly not one star, either. 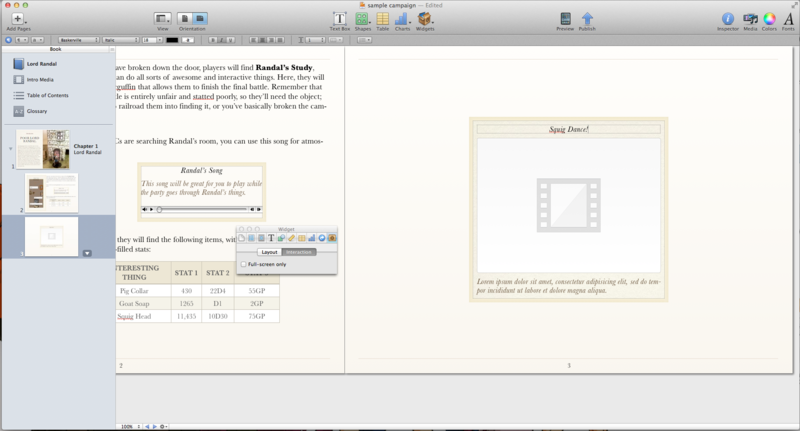 Many complaints say that much of what the iBooks version accomplishes, a PDF also accomplishes, and that might be true. Still, as far as I can tell, the only PDF versions of the book available are illegal copies, so I’m not wholly swayed by comparing the functionality of a legal copy of an item to the functionality of an illegal copy. 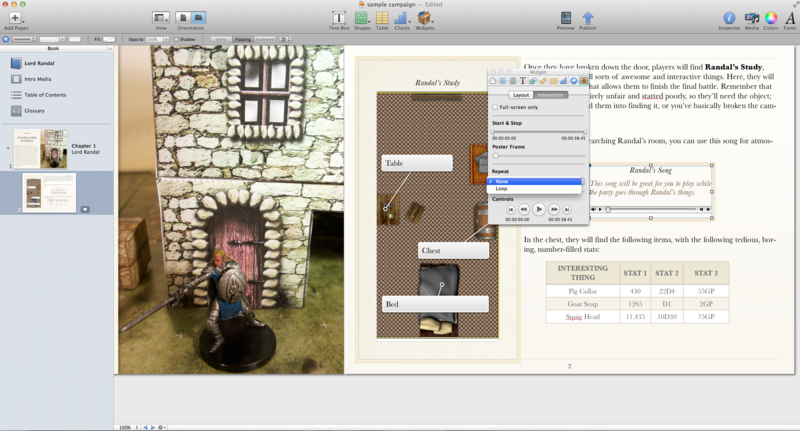 Players will likely find the iBooks copy very useful during actual play, and the interactive visuals make it a delight to sit and read. The hot-linked sections of the book will make it easy to find the information you need with a click. For instance, long fluff descriptions of individual units in the “Forces of the Space Marines” chapter link to the crunchy details in the “Army List” at the back of the book and vice versa, so you can get from fluff to crunch easily. 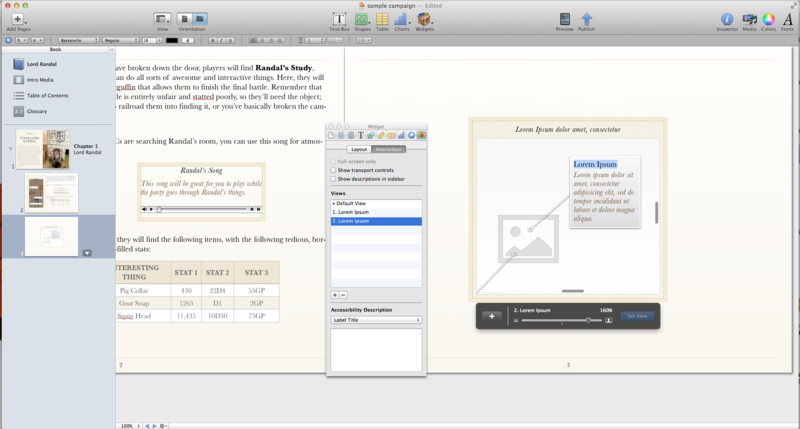 Standard iBooks navigation features allows for you to move from chapter to chapter easily, and GW has made the solid design choice to make each new chapter start with a visually distinctive page so you can quickly navigate to the section you need. The searchable glossary has all the game terms you need. If you don’t play a particular army or unit all of the time, you might easily forget how to use a specific skill you’re seeking. It’s faster to do a search for it in a digital glossary than to look it up in a paper copy. I’ve found that it’s also much faster to search the iBooks glossary than to do a search in a whole PDF, but perhaps that’s just me. You can also click on individual special rules within an Army List entry and have the glossary entry for the rule pulled up automatically. 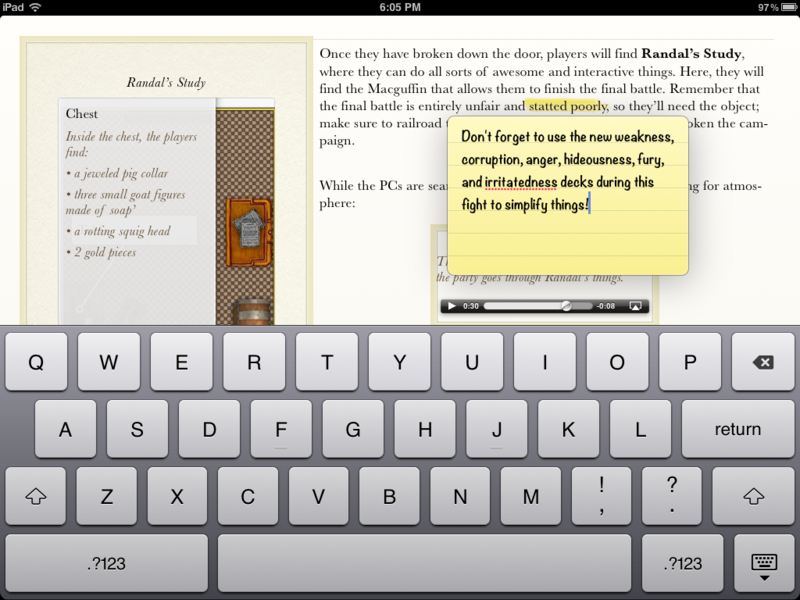 The iBooks built-in notes feature allows you to include house rules, refinements, and tactical information near the units and/or rules they modify right in your text without ruining the look of the book. The high-resolution graphics and pictures of miniatures look great on a Retina screen. For once, I could actually get close enough to see that not every ‘Eavy Metal painter is flawless. That gave me a +15 bonus to my Self Confidence. The Citadel 360 (or 360 Citadel?) models are kind of neat, and let you see how the painter has managed all of the details of a particular mini. You can re-use the graphics. Games Workshop probably won’t be thrilled that I point this out, but of course, you can take a screen shot of anything you see in iBooks. That means that you can grab included graphics, put them in your own graphics program, and use them for your own scenarios, RPGs, etc. For a GM like me, this may be one of the most valuable things about the Codex. You can’t lose or damage this book, since you can always re-download it once you’ve purchased it. Your iPad is also significantly smaller and lighter than an actual hardcover GW Codex. GW has made a handful funky, bad, or just weird decisions that detract from the overall experience. I suspect that eventually these things will get ironed out as companies like GW come up with standards for publishing iBooks documents, but I was surprised that a company with such a solid design team would make some of these mistakes, even on their first try. The designers use the slideshow function inconsistently throughout the book. It’s not a big problem–or a problem at all from a useability standpoint–but it’s rather offputting. Some galleries have thumbnails of included images at the bottom, while others simply have dots that indicate how many images are in the current slideshow. I found the differences distracting, as I ended up trying to figure out if the logic behind the choices. Similarly inconsistent is GW’s use of the Citadel 360 feature; I couldn’t always figure out why they’d decided to allow me to see some of the models in 3D and not others. If, say, they’d done 360 models of every commander and flat images of lesser units, I’d get it, but their choices didn’t seem so straightforward. While you can go to full-screen for some of the graphics, allowing you to see an individual item on a plain black background, you can’t zoom in to get a better look at the details of the images in the book. For a company that prides itself on detailed miniatures, I thought this was a weird decision. Some of that may be limited by iBooks; when I’ve played with it, I haven’t had many images that needed zoom functionality, so I’m not sure whether or not it’s possible within the iBooks structure itself. GW didn’t use the change page-orientation feature. I realized when creating my own iBooks that it’s kind of a pain in the arse; the engine doesn’t let you look at certain page elements when you have your iPad in portrait orientation that you can see in landscape orientation. Still, it’s often more pleasant to read long blocks of text in portrait orientation, so it would be nice if GW had given readers the choice. On the other hand, perhaps they were thinking that you would primarily use your iPad propped up on its SmartCover in landscape orientation as you played the game itself. Here are some things I’d like to see in future Codices and other RPG/miniatures rulebooks. I realize that these high-tech details can add quite a bit to the digital file size; perhaps companies could release both a bare-bones and a digital Collector’s Edition of their books. Sound. I’m a sucker for gimmicks, so I’d like to hear some sound. Have one of the Black Library voice actors read us some of that fluff at the beginnings of chapters. More color. Companies cut back on color when printing because it costs so darn much, but it doesn’t cost in a digital copy. Go ahead and color in those little details at the top of the pages. Make it look more like a Fantasy Flight or an old-school White Wolf book. Video. Gameplay tactics, miniature painting tips, or fluff delivered as video would take digital manuals a significant step ahead of paper copies. OVERALL VERDICT: LET’S SEE MORE! Quite honestly, I’d repurchase most of my RPG/miniatures manuals if they were re-released in this format. I think the search, glossary, and notes functions alone would make them far more useful at the table than a printed copy of the book, and being able to yoink graphics from rulebooks for my own personal use fills me with joy. Further, I’d much rather carry one iPad to my local gaming store or to my friend’s house than a whole stack of hardbacks, especially if I’ve also got to carry a box filled with minis. 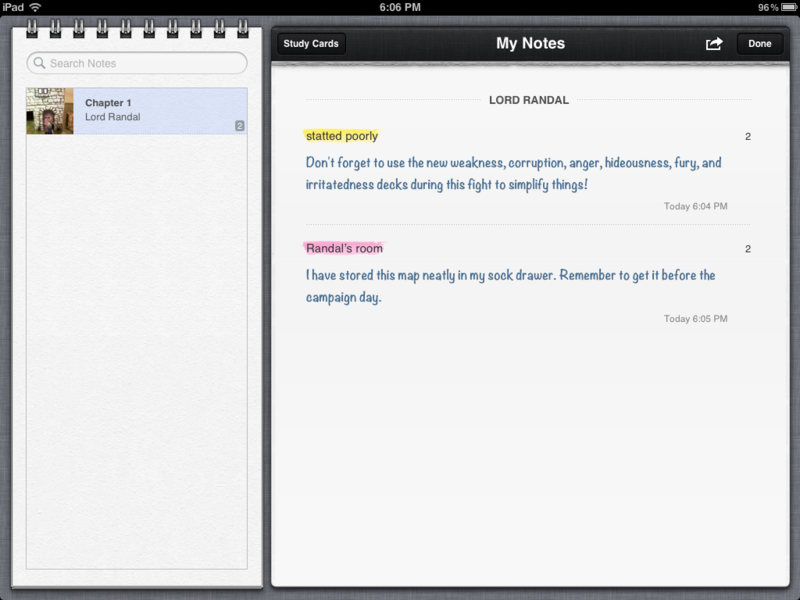 Let’s face it; I’m probably going to take the iPad anyway, so why not cut back on other stuff I have to carry? I will give all of the one-star reviewers the fact that there’s some sticker shock; it made my heart skip a beat to push the PURCHASE button on my iPad, since I’ve never bought any single item that expensive before. Yet I think we have to move beyond automatically valuing paper copies over digital copies. When I pay for a digital copy, I consider the unlimited downloads and the green factor, both of which are worth money to me; YMMV. In fact, if GW included video and sound not included in the paper copy, I’d highly support its costing the same as the paper book. At the moment, though, the former isn’t where we are in our cultural assessment of the value of etexts, and the latter isn’t where GW is in its iBooks production values, so they should probably offer a modest discount over the hardcover copy until digital copies become more commonplace. I can’t tell you if you should purchase this item. If you’re a tech junkie who’s attached at the hip to your iPad like I am, then it’s a no-brainer. If you already own the paper copy of the Codex and happily lug it everywhere, then it might not make sense for you. I can say, though, that I hope other gaming companies leap on the bandwagon and use this technology, since I think it could really take gaming books to a whole new level of useful interactivity. …and if that doesn’t prove my loyalty to Games Workshop the Emperor, I don’t know what will. Awesome! I talked awhile back about how RPG scenario writers might put iBooks Author to good use, so I was excited to see the announcement on Twitter today that Games Workshop plans to release a line of iBooks supplements for its wargame. GW plans to release a handful of texts each month, and the company has obviously dumped some real money into making their initial offerings both useful and beautiful. The official video shows some of the etexts’ innovations. 3D images of their models that readers can rotate to view from all sides seem like a good way to get a sense of whether or not you really want a particular miniature, and videos and slideshows that explain how to paint models so that they look like the ones shown in particular scenarios will help those who want to learn good painting techniques. The video also goes out of its to point out that the search functions and the notation functions of iBooks will make using rules from these texts easy mid-game. 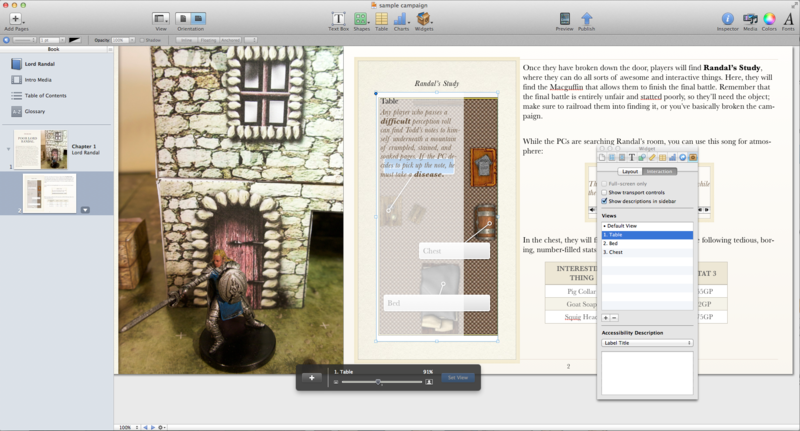 I’m really glad to see some gaming companies jumping onto iBooks and using the Author tools. I do wonder how much crossover there is between the GW crowd and the Apple crowd; they wouldn’t have struck me as quite the same people, for the most part, but I’m glad to see gaming companies make use of this technology. I’m going to wait until the Codex: Space Marines hits the virtual shelves, and then I’ll do a review of it. I can’t wait to see what it’s like! 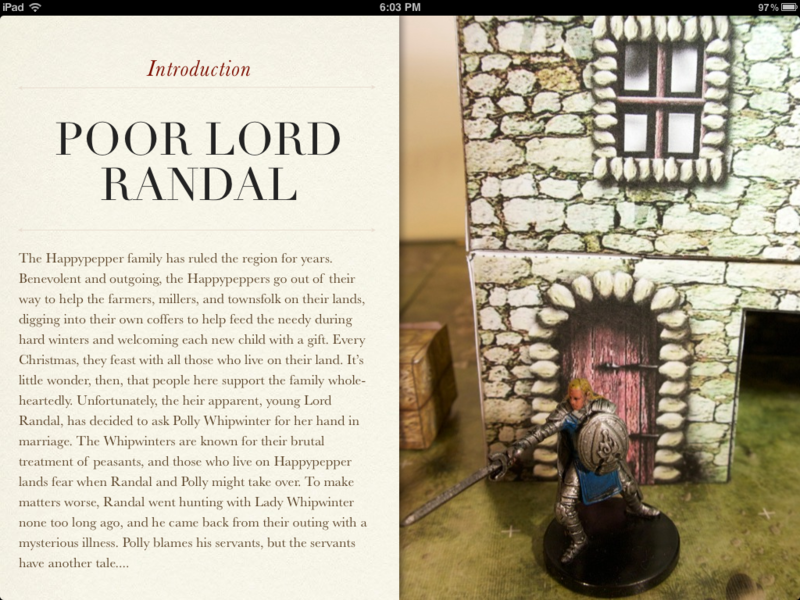 In the future, I hope that companies like GW expand their use of the functions of iBooks to some of their fiction offerings, and I’d love to see Fantasy Flight jump on the bandwagon and release some of their WFRP3e materials in this format, too. I want to talk for a second about the awesome Zombies, Run! 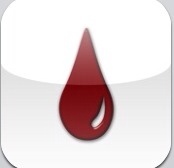 app for the iPhone. As you’ve probably guessed, I buy a lot of apps. About 70% of them are versions of other apps, and another 25% are copies of something that existed before the iPhone. This falls into that last 5%–something truly unique; an RPG for runners, where you “level up” by completing mileage. As you run, this app tells you the story of a world beset by zombies; people in a “safe city” radio instructions and information to you about the world and its inhabitants. When they’re not speaking, the app returns you to your playlist, neatly set into the story world as a radio station playing the few motley tracks still left over after everything collapsed. During the radio running sections, you pick up items that flash up on your screen or that you can check out at the end of your run. When you’ve finished your run (or your “mission,” for each run sends you out to do something for the city,) you can give the items you’ve found to the various institutions in the city to strengthen them against the zombie hordes. If you’re feeling particularly good about your running prowess, you have the option of adding a speed training element with zombie rushes. The game will then make you speed up when you get close to a swarm of the undead in the story. if you’re in traffic or just don’t want to do the speed training, though, you can turn that option off and run at a steady pace. One of the neatest things about this app is that it tries to remain polite at all times; if you’re playing your own music as you run, it attempts to wait until a track is done before breaking in with more story. If a track is particularly long, it does pause it to speak, but for your average-length song, the app tries hard to let you finish before it kicks back into the narrative. Further, unlike apps like Nike+, the voices don’t play over the music; the program stops the music altogether so that you can concentrate on what’s going on. If you’re prepping for a zombies campaign or for a marathon, this might just do the trick to get you in the mood. It’s an odd little creation, but I hope it will get copied by other companies. Personally, I’d love to see GW or FFG put out a Space Marine version. Nothing’s more inspirational than imagining that Nurgle is on your heels, really. I Can’t Remember When You Died. Or If You Died. Like many people, I’m terrible at doing things I find boring. Like a true tech geek, though, I’ll do a lot of those things if I get to track them on a gadget. That’s true even if tracking them on a gadget is FAR more work than just not tracking them at all. For me, those activities include a whole host of things: keeping track of my meeting schedule, recording my running mileage, and…ahem…remembering to blog. In terms of RPGs, I will exhaustively take notes about the adventure, recording details of flora and fauna just in case a PC asks me. I create charts about the contacts the PCs have made in different adventures, and I sometimes practice NPC accents days before the session. I keep calendars of what the PCs did on which days of the in-game month. What makes my eyes cross with boredom, though, is the nitpicky recording of stats during a battle. I’m just awful at it. I can set up exhaustive or simple tracking systems ahead of time, but halfway through, I’ll realize that I forgot to record the last four hits on the Orc because I was too busy describing the blows or amusing myself (and occasionally the players) with his funny voice. Although I like to complicate my GMing with Stuff, I’m better off with something simple in this arena. Many programmers of the initiative/fight trackers had the specifics of d20 systems in mind, so much so that they won’t work well for someone running WFRP or Burning Wheel games. And if there are too many buttons, there’s a slight chance I’ll get more interested in the gadget than in the encounter. I was therefore rather pleased by the straightforwardness of the aptly-named Hit Point for RPG. You type in character names and hit point values, group PCs and NPCs into encounters ahead of time, and tell the program if you need duplicates of a particular monster in a given scene. In the heat of battle, you add or subtract points with the keypad. “Kill” and “heal” buttons bring the creature’s hit points to zero or full respectively. Best of all, the program works on both iPad or iPhone, so if your iPad is tracking something else during combat, you can use this on your phone without having to switch between programs. I haven’t had a chance to try this in a session yet; it’s possible that the clicking back and forth between individual screens will prove more trouble than its worth. Still, I know myself, and I know that I’m more likely to keep track of hit points on a screen than on a piece of paper. Perhaps this program will prevent future occurrences of The Orc who Never Dies or The PC With Some Number of Hit Points between Five and One Hundred Million, both of which have might have haunted my table once or twice.